1) Add berries with white sugar and stir. Let sit for about 10 minutes. 2) Mix together Smart Balance, Canola oil, brown sugar, cinnamon and nutmeg. Add oatmeal and stir together. 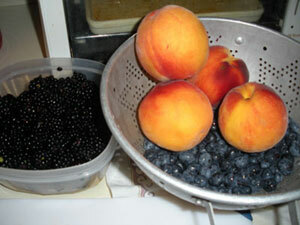 3) Pour berries, peaches or berry and peach mixture into a medium casserole dish that you have greased with Canola oil. 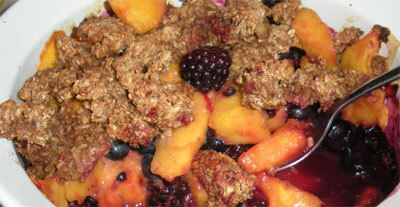 Top evenly with oatmeal mixture. 4) Bake for about 25 minutes at 350 degrees. 5) Serve hot with vanilla soy ice cream.